If you are looking for an accurate account of events leading up to the royal wedding, engorged with delicious backstage gossip and personal accounts to make Hello! readers blush, The Prisoner of Windsor probably isn’t the play for you. The Olympic sprint through scenes inspired by Anthony Hope’s novel The Prisoner of Zenda tells the farcical tale of Prince William’s attempt to master his speech prior to his impending nuptials. With a troop of immigrant gardeners on hand to aid the prince, it falls to the Romanian in the group, Romulus, who, curiously, also looks like Wills, to step in and save the wedding. Written before the wedding and pitched as a ‘musical comedy’ and ‘satire’, the cast makes up in enthusiasm what the play lacks in comedic content. It feels as though writer and director Justin Butcher, who also wrote the successful The Madness of George Dubya, compromised his original work with an ‘insert yet another reference here’ approach to playwriting. Drawing from material as diverse as The King’s Speech, through Romeo & Juliet and Plato’s Republic, the script regularly loses its way, confusing the audience as to what the purpose of the play really is. Saying that, it wasn’t an unpleasant evening. Stephen Guy Daltry gives a notable performance as, quite literally, a drag Queen and an underused Phillippa Peak takes inspiration from Black Adder’s ‘Queenie’ and the popular ‘Gap Yah’ sketch to create a standout Kate Middleton. Despite the occasional laboured scene, the production was pacey and energetic, with regular smiles and a titter or two coming from the audience. Thanks to the cast, The Prisoner of Windsor certainly has heart, but the play itself seems to be a little confused by its own existence. 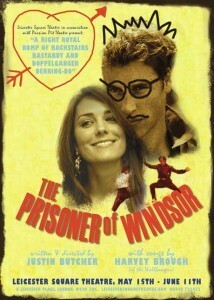 The Prisoner of Windsor runs at Leicester Square Theatre until 11 June. Tickets here.